The Most Beautiful Oriental Style Furniture for Your Home! Beautiful Oriental Style Furniture for Your Home! Are you looking for the best and most beautiful oriental style furniture pieces for your ‘zen’ home? I LOVE oriental furniture and I am always looking for the latest oriental pieces being sold! I was able to select some of the most beautiful and very cool oriental style furniture pieces being sold online! From gorgeous oriental garden stools to beautiful oriental cabinets, unique room dividers and even a gorgeous oriental dining set and a cute oriental zen coffee table! My favorite pieces are the ones in gold leaf designs! *By the way, what a gorgeous Asian nightstand! I will keep adding new pieces over time as they come! I hope you’ll enjoy the ones on this page! We start our selection of oriental style furniture for sale with this gorgeous and very floral oriental garden stool! I love the design and the red background! It is made of ceramic and it’s in a classic barrel shape. Classic Asian Gold Lacquer Two Drawer Oriental Shoe Cabinet! 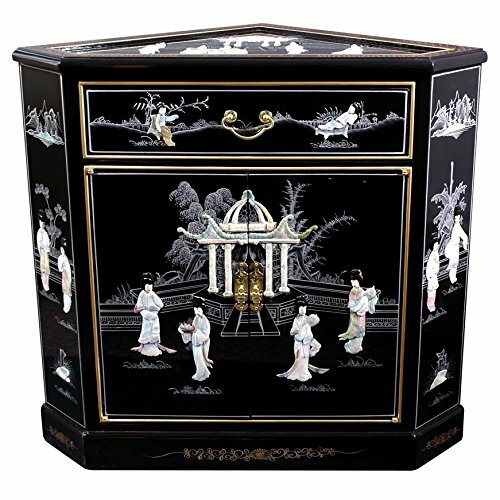 When we talk about oriental style furniture, the first thing that comes to mind are gorgeous Asian cabinets, of course! 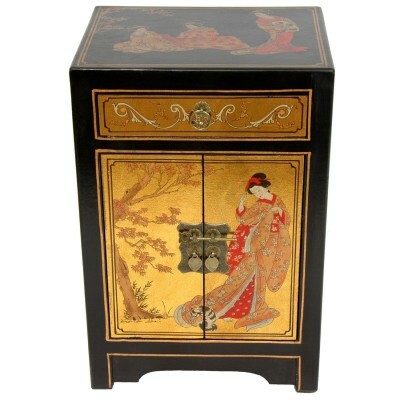 This is a stunning hand-painted and hand-crafted oriental shoe cabinet in a gorgeous gold lacquer finish! I love the color and beautiful oriental courtyard designs! Great gift idea to a new home owner who enjoys oriental furniture! Very useful furniture piece to have in your home and gorgeous at the same time! You can also use it to store liquor, shoes or anything else you’d like! Beautiful and Unique Asian Cabinet for Sale in a Ming Design! Beautiful Ming design Asian corner cabinet for sale! 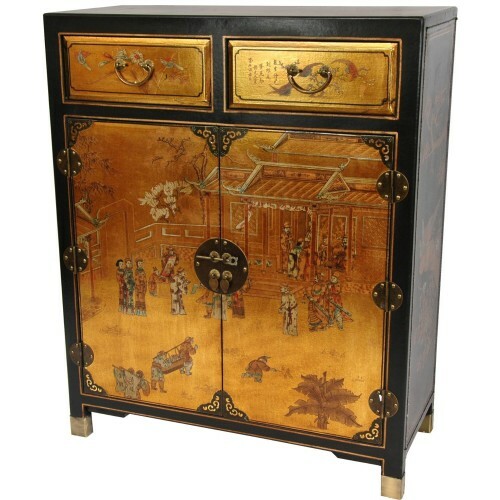 Corner cabinets are very popular oriental style furniture pieces! They also look great no matter which corner you place them! I love this black lacquer finish with mother of pearl! Beautiful Floral Motif Tibetan Cabinet for Sale! This is by far the most beautiful handmade oriental style cabinet I have ever seen! 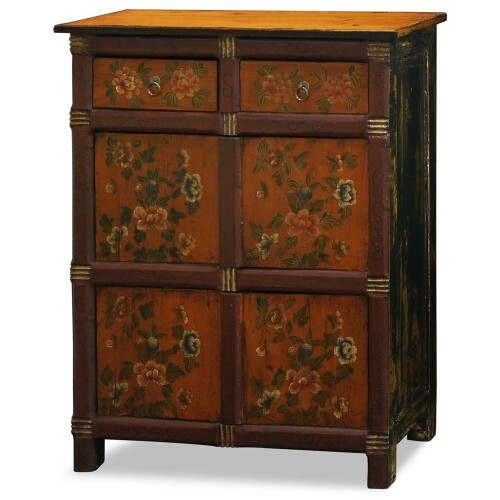 It’s a gorgeous Tibetan style floral wood cabinet! Beautiful piece to have in your home! Will give you lots of compliments! It has two large double door compartments and two very cute drawers! All hand-crafted in elm wood! A stunning and sturdy piece without a doubt! 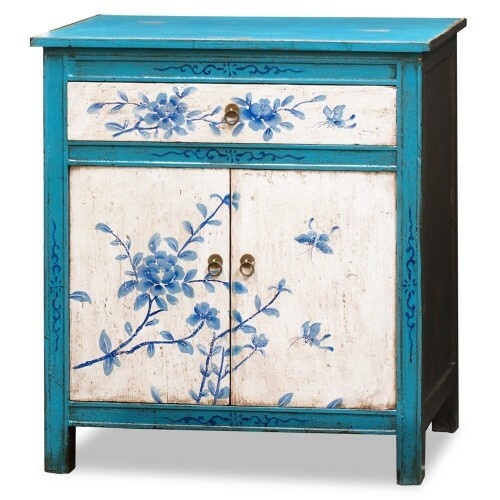 Gorgeous Hand-Painted Blue Floral Motif Tibetan Cabinet! I also had to show you this very cute blue floral Tibetan cabinet with one drawer and a nice and spacious double door compartment! It’s very cheerful and unique, and also made using solid elm wood! Very Unique Hand Painted Gold Leaf Small Oriental Chest! 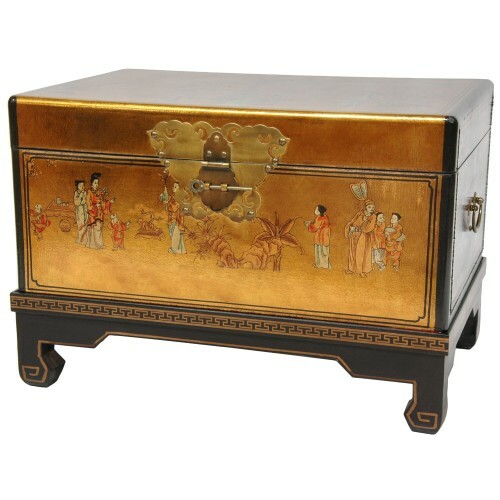 What a gorgeous golden oriental chest for sale! It’s also full of oriental designs inside as well! A truly magnificent piece to have! 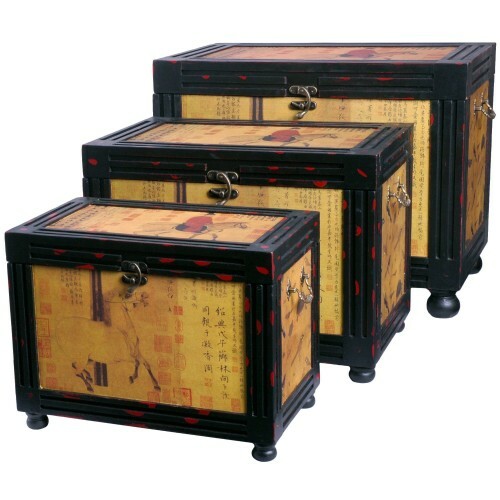 Very Cool Oriental Storage Boxes Set of Three! Best Oriental Style Furniture for Home! What a gorgeous oriental storage box set! 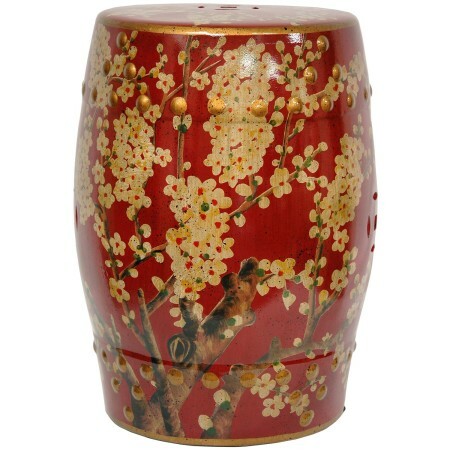 Great addition to your ‘oriental style’ home! Yes, you will get all three of them! Gorgeous Birds and Flowers Gold Leaf Oriental Stool! 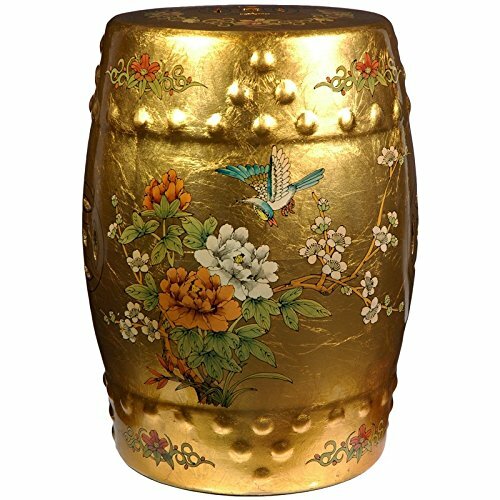 This is a stunning gold leaf oriental porcelain stool! Gorgeous bird floral design in the gold background! It stands 18 inches tall. 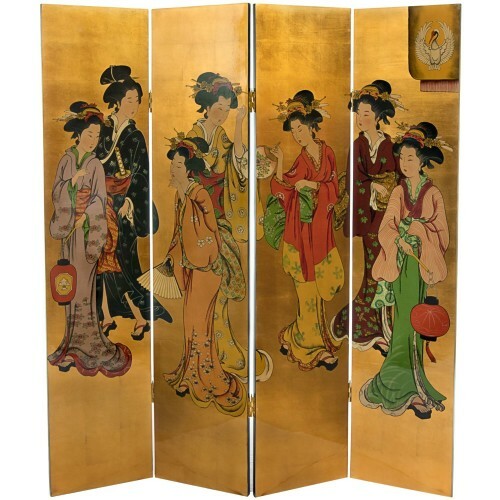 This is the most beautiful Geisha design oriental room divider screen I have ever seen! Exceptional piece to have in your home! Beautiful Oriental Style Furniture for the Living-Room! 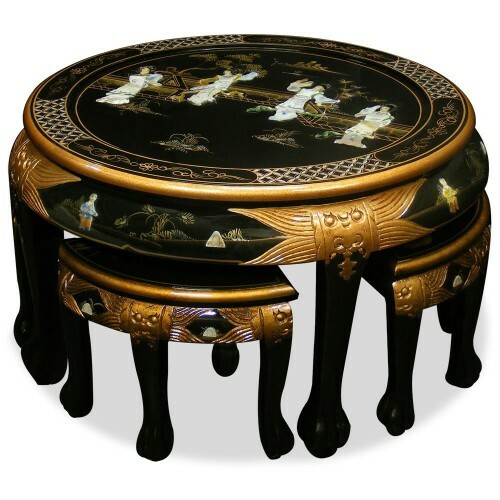 How absolutely gorgeous is this oriental style round coffee table with four stools? It has a classic mother of pearl maidens courtyard scenery design all over it! It also comes with a glass top! Definitely a stunning piece to have in your ‘oriental style’ living-room! Everyone will say ‘Wow, where did you get this?’ when they see it for the first time! 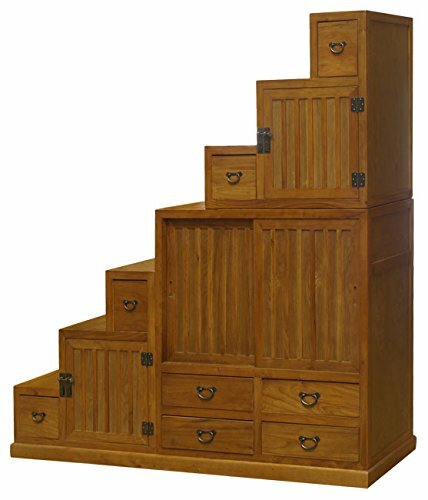 Beautiful Japanese Style Step Tansu Cabinet for Sale! Beautiful Tansu cabinets also come to mind whenever we talk about oriental furniture, of course! This is a gorgeous and very tall elm wood Japanese style Tansu cabinet! It has eight drawers and three spacious compartments as well! I love this hand-rubbed walnut finish! Will look stunning anywhere you decide to place it! Beautiful Oriental Ming Style Rosewood Dining Room Set! 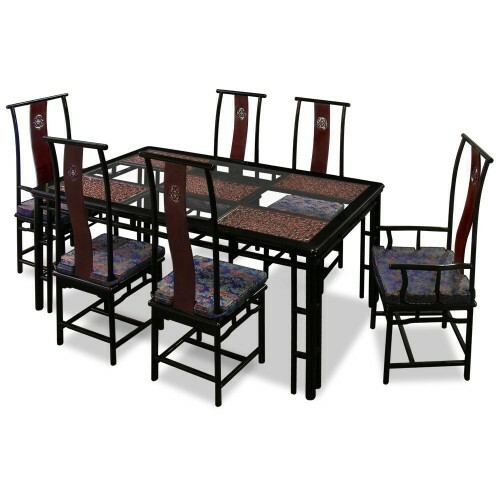 And finally I present to you this gorgeous oriental Ming style dining room set hand-crafted in rosewood! It also has a gorgeous cherry finish and lovely floral cushions on the chairs! *I hope you enjoyed my selections of oriental style furniture from this page! Best Chinese Cabinets for Home! Cool Buddha Statues for Sale!